Two grounds backwards, two grounds forwards – finishing last season on 76/92 I am now back on 76/92, Rotherham & Morecambe replacing Rotherham and Colchester, if you know what I mean. It was nice to be going to the game as an away fan, as I was accompanying Tom to watch his beloved Darlo team (they’re just friends now though after this performance). It was an excellent day out and fulfilled all the criteria of a great away day experience except one…the one that is often conspicuous by its absence – a good result. I met with Tom at noon and he drove the 90 odd miles up to Morecambe which took about an hour and forty five minutes, a good amount of time to build up the atmosphere, get a bit of background on my team for the day and worry about the fixture being called off (as it was at the same time last year, after 22 minutes, in similar meteorological conditions). We drove in by the coast road which gave us a nice winter view of Morecambe Bay under a waning gibbous moon. We arrived around 2pm which gave us time to sample a delicious Fish & Chip shop just outside the ground. The chips were piping hot and lovely – a good start. Next up was a pub for a pint of real ale which we found a short walk up from the ground in the York Hotel; left out of the chip shop and about 5 minutes up the road. The train station is not too much further up the road for those who like to go by public transport. It was a free house selling some fine real ales, and adorned with the scarves of football clubs that had played at Christie Park. It was a friendly place with a big screen showing the early Premiership kick-off. The early view I got of Christie Park showed that it was a fair size for a team that had spent its entire existence in non-league until two seasons ago. Ironically, the good view of the ground was only had because the near long side consisted of an Arc car wash where one would normally expect a stand. You could peer over the low wall at the rest of the ground. Beyond the car wash and dividing wall was a tiny terrace, with a dandy Heath Robsinson style structure housing the TV cameras. Morecambe were founded in 1920 and have always played at Christie Park, although it wasn’t originally called that. This season could be the last one to see them play there as they have plans to be playing in a new stadium by the start of next season. Christie Park looked more like a traditional old league ground than those of most league teams, on the other three sides. The Darlo fans (of which I was an honorary member for the day) stood on the Umbro covered terrace which rises nine steps up and houses what appears to be some kind of press box. Opposite this is the North Stand; a larger terrace where the Shrimps singing contingent stood. Darlington,as Tom almost proudly asserts, have been rubbish since 1883 (10 more than today’s crowd). I couldn’t argue with him on this performance. A lacklustre first half only augured for a goalless draw, but Morecambe came out in the second half with what certainly appeared a greater desire to win. I must’ve got Darlo on a bad day, such is my jinx on teams, as before this they were lying in fourth with a good away record. Tom was obviously disappointed but, when the cloud of defeat had blown over out towards the Irish Sea ,we could look back on an otherwise great experience of Morecambe. Their traditional ground will be missed if they move, and I will be one step backwards once again in my 92 mission. This entry was posted in Groundhopping, Travelog and tagged christie park, darlington, morecambe, morecambe bay. Bookmark the permalink. A grand day out, bar the result. 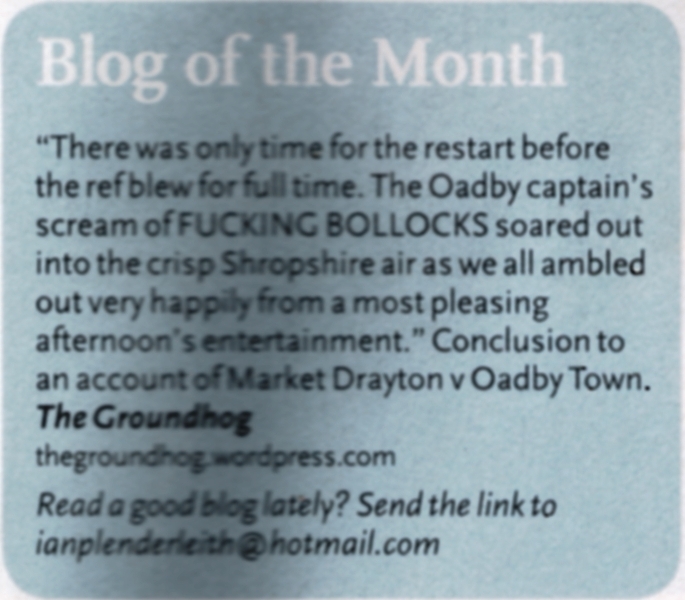 I look forward to your account of Shropshire’s labyrinthine back lanes!